"We see Israelis think that American Jews care more about Israel's handling of security matters than the social justice concerns. Israelis views of American Jews are, in part, a reflection of Israelis' own identities; thinking that American Jews care about the issues that Israelis care about. To some extent, that's true. But American Jews most involved with Israel are also very tuned into Israel's treatment of women, Arabs, and Conservative and Reform Judaism." Cohen continued: "This gap -- between reality and perception -- suggests an important educational mission: To make Israelis, especially political leaders, aware of the extent to which American Jews care about social justice issues, alongside their concern for Israeli security issues." (Prof. Steven M. Cohen, Director of the Berman Jewish Policy Archive @ NYU Wagner). 1. To what extent do you think that the support of American Jewry is important or not important to Israel's security? 2. To what extent do you think American Jews care or not care about the security problems of Israel? To what extent do you think American Jews care or not care about these issues that concern society? 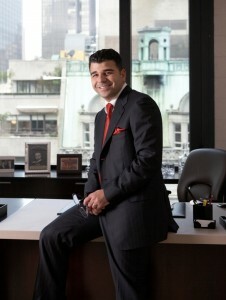 New York, NY – Ilan Bracha often reflects back on the milestones that got him to his current position as one of the country’s most prominent and powerful real estate tycoons. He enjoys mentioning his previous IDF role, an infantry officer in the ‘Golani’ brigade, where he commanded over 120 troops. This coming April, Bracha will mark exactly one year as chairman of the nation’s third-largest real estate franchise, Keller Williams Realty in NY where he completed sales of $200 million to date. Following his service in 1996 and at the age of 21, Ilan Bracha came to the US for a visit and immediately fell in love with the city, deciding to stay. A friend offered him a job as a ‘mover’, a job that changed his life. It was a year into his job that he was asked to move Lewis Kaye of LBKaye International, a commercial broker who mentioned his impression of his ‘magnetic personality’ with a strong recommendation of going into real estate. Bracha returned his truck, got his license and took off to a new career. Noting Ilan Bracha’s contributions in the Israeli military as an officer, his ongoing support of Israel and Israel’s vivid business environment , he and his wife Mati were announced as guests of honor at this YBA (Yeshivot Bnei Akiva) 33rd annual tribute dinner. YBA is Israel's largest religious Zionist educational network. YBA’s network consists of 70 schools across the country and 23,000 students educated in spirit of leadership and realization of their potential in every walk of Israeli society. Alumni of YBA can be found not only among the highest ranks of the Israeli Defense Forces, but in the arts, sciences, education, medicine, industry and politics as well. Among the graduates are the current Deputy Chief of Staff of the Israeli army; the Chief Rabbi of Israel; the Chief Rabbi of the IDF; the Chief of the Israeli Police. 40% of today’s young officers in the IDF are graduates of the network’s institutions, as well as nine of the current Knesset Members and Ministers. YBA is chaired by Rabbi Haim Drukman- who will be receiving this year’s Israel Prize of Life Service to the State of Israel during Israel’s 2012 Independence Day celebrations. The 33rd Annual Tribute Dinner will take place Tuesday, March 27th, 2012 at the Museum of Jewish Heritage, 36 Battery Pl. New York, NY 10280 from 6 to 9 PM EDT. Democratic Congressional candidate pledges strong bi-partisan support for Israel; criticizes Obama on Iran. (interview by Jacob Kornbluh). Queens Assemblyman Rory Lancman, is running in the Democratic primary in June, to represent the new redistricted district once held by congressman Gary Ackerman, who announced his retirement last week. In a district that will include parts of the congressional district where Republican Bob Turner beat Democrat David Weprin in a special election last September, in which Turner's message to send a message to Obama on Israel played a major role. Rory Lancman believes that in terms of representing the district, he's the strongest candidate with a proven record, as a strong advocate for Israel, counter-terrorism and Jewish causes in the NY State Assembly. Lancman, doing some quick learning from Bob Turner's book, did not fall shy of criticizing the president on an issue that the Democratic party is strongly committed in defending the President on - Iran. "There's a lot of things to do in Washington," he said. "Iran is still marching ahead towards developing a nuclear weapons. We still don't have a commitment from this President that satisfies me, that he will do whatever it takes to make sure that Iran doesn't develop a nuclear weapon." elaborating on the Iranian issue (as a co-sponsor of the Iran Divestment Act of 2012 that passed in the NY Assembly. He also wrote a joint op-ed with former Mayor of New York, Ed Koch challenging then-Senator Obama to get tougher on Iran), the Assemblyman joined members of congress calling for a unified US/Israel position on Iran. "A lot more can be done. Making clear that the obligation to prevent Iran from developing a nuclear weapon does not ultimately rest with the Israel defense forces alone, but as a joint responsibility of the U.S., Israel and the western countries, that have a interest in peace and stability in the middle east and the world." Using the harshest words of criticism articulated by a Democratic party member, Lancman expressed a great amount of concern on the president's dealing with the issue. "I'm very concerned, that the President's framework for ultimately resolving the Iran- nuclear question is: 'OK, i will let Israel go and attack Iran.' I think that is very unfair to Israel, both in terms of us not potentially sharing in that burden. But it also further stigmatizes Israle in the world,. in a way that is very unfair and dangerous for Israel and Jewish citizens everywhere." Speaking of the actions that could still be taken, placing a credible military action on the table, to be an option if necessary. The hopeful congressman, issued this pledge as a commitment based on his record in Albany. "In the bottom line, we cannot live in a world where Iran has nuclear weapons. And if I'm elected to congress, I will do everything that a congressman can do, to make sure that that doesn't happen." Another issue, that Mr. lancman has been very vocal over in recent days is, The Non-Profit Security Grant Program, which provides security funding for institutions that are classified as “high risk” by the Department of Homeland Security, reducing its funding from $19 million to $10 million as part of a $1 billion cut to the Department of Homeland Security in last year’s budget. "I'm very concerned that we are getting relaxed about the threat of terrorism here at home," he said. "I was shocked, that congress cut in half the federal program giving grants to non-profit constitutions that protect them from terrorist attack, which is an issue i was very involved in." "I like to think of myself as a very strong advocate for Jewish Causes and for the State of Israel. And I make no apology of that whatsoever," Lancman, the only Jewish candidate in the race, pointed out about himself. Hoping to build on a strong Jewish and pro-Israel showing in the primaries, as he runs even with two relatively popular candidates. Asked how he can overcome the party picked candidate, that hopes to be elected as an hero, as first Asian woman in the House of Representatives. "I don't make any apology for being a fierce advocate for my community", Lancman responded. "And I don't make any apology for being a strong advocate for Israel, which is our homeland as a people". "So, I would be flattered, if anyone in the Jewish community thought of me as an hero for Jewish causes," he added.